On the ninth day of giveaways, Lozzy Lou Designs gave to you.... a Playmat. Ok already going slightly crazy with giveaways or perhaps getting into the Christmas spirit of giving. Yep that sounds better! Lozzy Loo Designs is full of wonderful gift ideas for that special person in your life. Lozzy Loo Designs was created from Nicole's love of sewing and creating wonderful handmade items. Lozzy Loo Designs was named after her beautiful daughter, as she started sewing after she was born in 1995 and after joining a wonderful mothers group that had a passion for anything handmade. I have one of these playmats for my son's Lego and it is fantastic. We love putting it out flat on the ground to play and find pieces and clean up is just so easy. Pick it up and you are done. 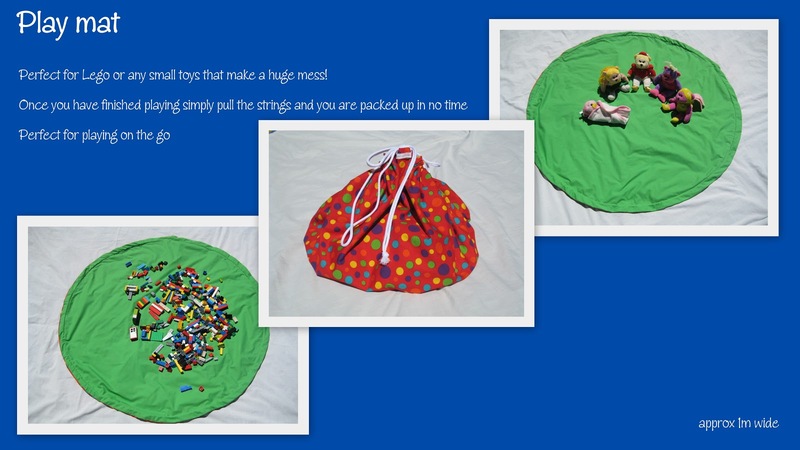 Features: Double sided playmat suitable for boys or girls. Perfect for storage Lego or Barbie mess ... ahem creations! Valued at $35. The giveaway will be open for one week. Stop by each day to see what else is on offer! Winners will be contacted via email two days after the giveaway closes and announced on the blog on Friday 7 December.